Being a detailed account of our experiences with electricity this winter, and how to build your own simple bike generator. Food energy pumping directly into a battery. Living in the woods, there are no convenient plug sockets. It is of course pleasant to live in a house without walls full of piped electricity – but it is also a fundamentally difficult thing. We know we don’t need much electricity to survive – our kettle, oven, hot tap and central heating are all provided by the wood-fire, and our lighting is most candle-powered. But, a little leccy does really make life easier. Our daily focus, this winter, has been on the more obvious commodities – wood, water, fire and food. But the intangible force of electrics, in trying to document our findings, tell our tales and sell the CD, is still very important. We need power flowing into our two mini laptops, fairly alrmingly regularly. These devices are also used to charge our telephone. They are our main electricity requirement. 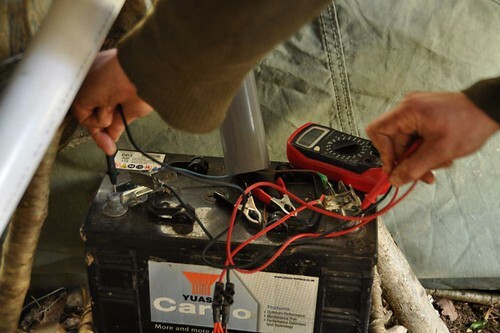 Everything else, such as head torches, cameras and voice recorders, are so infrequent to need charging that they can be carried to a local friend’s solar and wind inverter station. 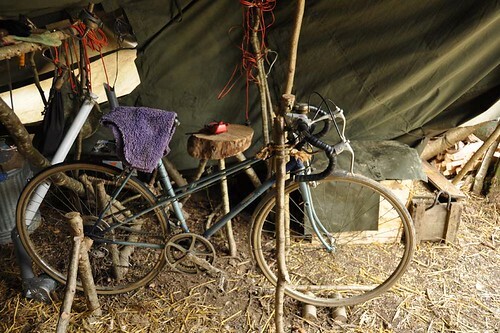 But we wanted to become a self-sufficient group, and so for this electric issue we decided to put our faith in one of the cheaper and more hands-on forms of electricity generation – the bicycle generator. None of us knew much at all about this sort of thing, but with Rose as our driving force of discovery, we soon found that it was very easy to bodge a machine that will gather (make?) the electricity we need. For the first month of our Welsh woodland winter, the little electricity we used was fetched from friendly local places. However, the nearest ally lives 5 hilly miles away, and the journey always ages, mainly for the reason that its midway destination was warm and cosy, and we’d rarely hurry back. It’s a fine thing to make electricity a social event, to go out, socialize, use broadband, and collect electricity. But, as an experiment in self-sufficiency and low-impact living, we needed to be providing for ourselves. So we sought new options. Electricity is a serious boon in life. It makes many things easier. We feel that with decent reductions in our electricity consumption as individuals, and with experimentation into appropriate technologies, we could all meet our basic electricity demands with low-impact renewable resources. 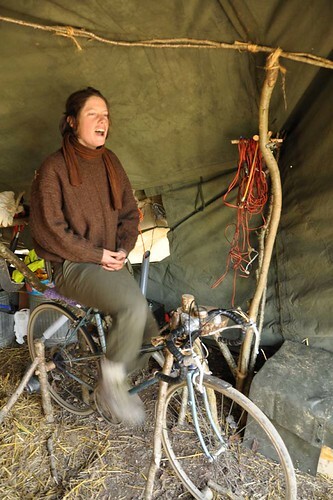 Small-scale wind, hydro-electric and solar are solutions being tried by many folk we meet. Some generate sufficient power to re-sell to the National Grid, to in turn cover their net costs. However, such things require some decent investment, while we just we wanted to get it working quick and cheap. 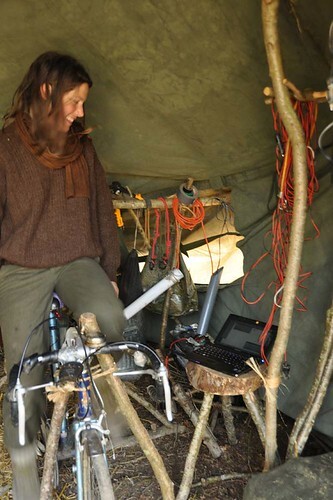 So Rose volunteered to experiment at building a bike generator, which she’d never done before. 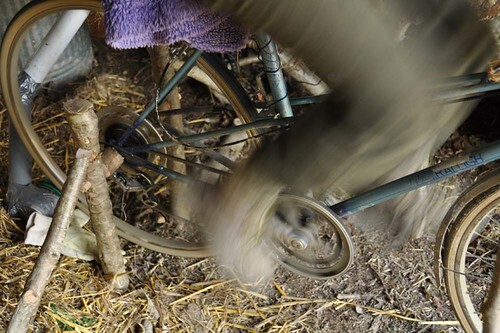 A bicycle generator, while fairly inefficient and intensive, gives us a physical connection with the energy we use, and keeps our limbs warm. It is also a satisfyingly visible process, with whizzing wheels, and when not in use doubles as transport. Talking to people, and researching online, gave us a good idea of what we needed. Half the parts were gathered before we came to the woods, and the rest found locally. All was assembled together in the spare minutes around the construction of our winter home, and was perfected a month into our stay. The key component, aside from a bicycle, is an electric scooter motor. The basic idea is…a scooter motor turns itself when electricity flows into it. But if we turn the scooter shaft ourselves, we create electricity, by reversing its normal function. Simple. The scooter motor is a ‘permanent magnetic motor’, which means, as we understand, that inside it are two discs with magnets attached. Each disc has the same number of magnets, with opposite sides facing inwards, to pair the magnets, ensuring a strong attraction. One disc is fixed, while the other turns, a bit like mill-stones. There are copper coils where each of these pairs meet. When we turn the motor-shaft in the correct direction, we turn one disc of magnets past the opposing fixed disc, and the strong attraction makes electrons flow down the copper coils. If it all sounds a bit like magic, well it is used in almost the same way. It is a technology, that produces results, and the workings of it are understood by means of childish pictorial story-language, a GCSE approximation of science. But the story works, and the technology is proven. You could describe it as enslaved imps, all turning tiny wheels, and it would make sense too. After getting the parts, and getting the intellectual concepts grasped, the most difficult part of all was putting it all together. Fixing something to the motor shaft, for the bicycle wheel to turn against, was difficult without metal tools and a workshop. So Rose took the motor to town, and found help. Tim Gittoes runs an excellent agricultural specialist shop, in the back of the Hay-and-Brecon farm store in Llandrindod Wells. He suggested using a pulley, which he ordered in. Then he fixed this pulley to the motor shaft, by removing the cog, and sliding the pulley on with three pre-drilled holes. He then replaced the cog, and secured the pulley to it with three screws that sat on the cog’s indents. The next step was soldering the diode between the cables of the scooter motor, with extra cables so it would reach the battery. This was then smothered in electrical tape. Then we put on alligator clamps to the cable-ends, for easy connection/disconnection of the motor to the battery. 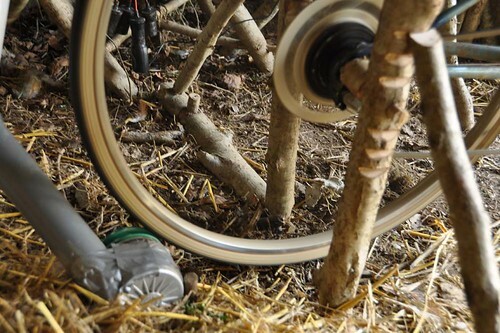 The motor was then screwed to a flat wooden board, which was staked to the ground behind the bicycle stand, so that the rear bike tire could sit happily on the pulley, and turn turn turn. 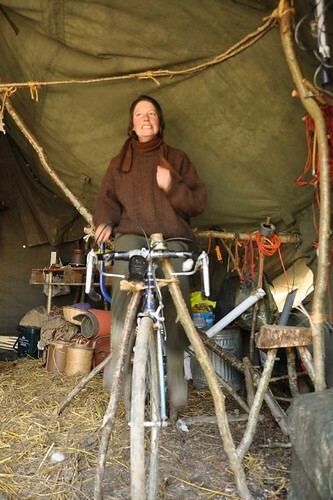 The bike-stand, which we could have spent £70 in buying, Rose made entirely from coppiced hazel. Obviously the back-wheel cannot touch the floor, or the bike would career off as it should. So it was lifted from the ground by right angle triangles of hazel, secured into the soil on each side of the rear wheel. 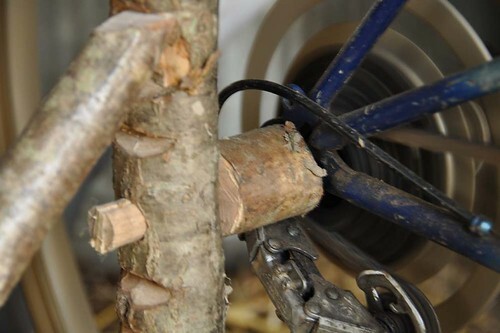 A bit of hazel was carved to slot over the rear wheel bolts, securing and holding the bicycle up. Two more angled upright posts, at the handlebars, compensated somewhat for the general wobbliness of it all. 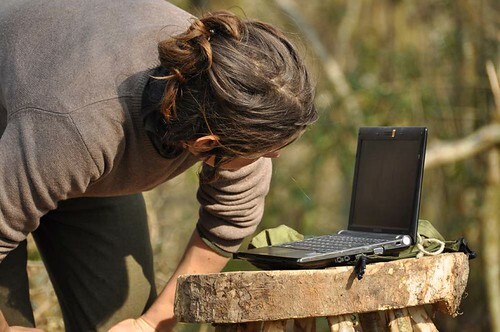 The next thing to do is find the right battery, to store and regulate the power, and to find car-cigarette-lighter connections, by which to chare the laptops direct from the battery. We started off using old car-batteries from the local tip, which while not powerful enough to start a car anymore, did suffice for our needs. But the frozen climate, and our initial infrequent usage, meant the half-dead batteries soon slumped completely, and we had to borrow something healthier. This came in the form of an unused bus battery, which is now working a treat (this blog-post being the evidence). Checking the battery levels with a voltmeter. A 12V battery, used in this way, does not want to be taken lower than 11.7V, or it will lose the capacity to re-charge and hold charge. There is also a maximum capacity charge, but we’ve never yet approached it. So all that remains is bicycling, and keeping an eye on the multimeter to see how much charge is held and lost, to try and master these rhythms with good sturdy pedaling. A typical reward, for cycling one hour, is about 3.5 hours of internet work, or 5 hours of typing. Lucky us. £46 was spent making this bike generator, and £12 on the multimeter. But it could certainly be made for no money at all. Old parts are often lying around unwanted in friends’ workshops, freecycle and the neighbours’ shed, could possibly sort you out with everything. Many other motors will work as well, or better, than the scooter motor. It was our motor of choice only because it was a safe bet, and time was short. 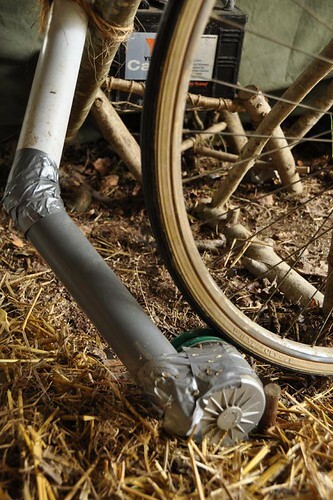 Here is what you need to make a bike generator like ours. Motor: a 12V 240W scooter motor (e-bay – £29). Cables: to extend the motor cables to the battery. We were given some, ripped from thrown-away broken power tools. 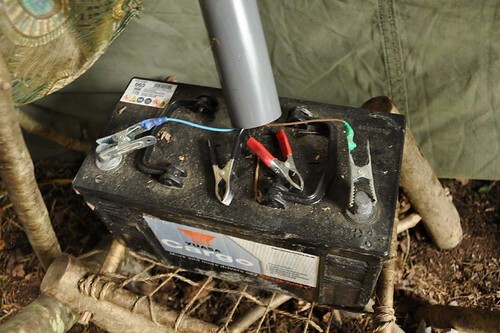 15 Amp Diode: put in the cable between the battery and motor, to stop electricity from flowing the wrong way. (e-bay £2.50). Electrical Tape: to safely cover the wires (£1). Battery: Initially we found a used car battery at the tip for free. Now we have borrowed a larger leisure battery from Ed’s dad. Bicycle: we used Ayla’s Raleigh Racer. A better bike, with slower gears and a more adjustable seat-post, would have been better. A comfy seat is crucial. Bike stand: made out of hazel from the woods, one of our most abundant resources. Multimeter: bought for £12, though you can find them cheaper. Soldering Iron and Solder: we borrowed on that runs on lighter fluid. * Use the best battery you can find, and treat it well. The system is only ever as good as the battery. * Use as small a wheel on the motor-shaft as possible, to create more motor-turns for each bicycle-turn. This is common sense efficiency, yet our own system uses far too big a pulley wheel, making it all that much harder. * Try and make the bike-stand to fit the best bike you have. The more gears on the bike, to allow slower harder pedaling, the better. Right now we have to pedal fanatically to keep the voltage high. * The more comfy the bike seat, the more likely your electricity will not come at the cost of future children, and the longer you will be able to cycle. * An inline fuse, fitted to the positive wire before the crocodile clip on the battery, will stop a possible short circuit and fire hazard. I didn’t know much at all about electricity until I started getting interested in making a bike generator. To be honest I still know very little but have managed to bring together a functional bike generator. Electricity has always seemed like quite a scary thing to me, capable of serious harm if not careful. But working with 12V electricity and starting with something simple like this bike generator I’ve become less fearful, though still very respectful, of electricity. I am more confident that I would be able to make more complex electrical systems if I so desired (possibly a small wind turbine). It has been a brilliant learning experience and it is empowering to have a better understanding of that which makes our modern world go round. Please let us know if you have any questions and let us know about your experiments with producing and consuming your own electricity! I’ve learn some just right stuff here. Certainly worth bookmarking for revisiting. I surprise how so much effort you place to make this sort of magnificent informative website. Can I use mouse power instead. All we need now is to install this in every home and then we are energy dependent free. Wow amazing keeping fit at the same time, genius! I have built some flux pedal generators and windmills at Pune , India for use in places where there is no electric supply. These can run not just lights and fans but a frig , computer and TV too. I like this site…good info. Will save it as a favorite. Is there a twitter page? I would like to develop this for helping the rural areas in India which are not connected to the electrical grid even in present times. This could be used to charge lead acid batteries for using 2 CFLs for about 6 hours every evening – maybe a small fan or a small TV could also be operated. Wonder how to go about attempting this – funding it – and later making it self sufficient. i don’t think i’ve ever seen anyone do this before, well done.